Asbury Park news: the Underground is Back! Have you heard the Asbury Park news? 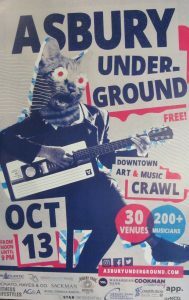 Asbury Underground is back on October 13th! Our twice yearly arts and music crawl is back for its fall edition, and that is always great Asbury Park news. There will be over 200 musicians playing at 30 venues around town. And it’s all free! We’re happy to be hosting songwriter, singer, and multi-instrumentalist Dan Rauchwerk at 1:30. A founding member of the internationally touring folk band The Lords of Liechtenstein, Dan has recently embarked on a solo career. His debut solo album, “We Are More Than What We Leave Behind,” will be released in late 2018. Here’s the Lords performing “Kool-Aid”. Hope you can join us on the 13th!